As a Police Officer, Why Can't I Collect Underinsured Coverage in PA? Home » The Law & You » As a Police Officer, Why Can’t I Collect Underinsured Coverage? As a Police Officer, Why Can’t I Collect Underinsured Coverage? A police officer was in a car accident. When he tried to collect insurance, the company said he can’t collect underinsured coverage because of an exclusion. Is this legal? Car insurance lawyers Greg Fellerman and Ed Ciarimboli have the answer. 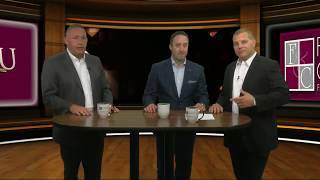 Dave Kuharchik: We’re talking about a police officer injured in a car wreck today in this edition of “The Law & You.” Attorneys Greg Fellerman and Ed Ciarimboli are back in the virtual law center. Good to see you guys tonight. Ed Ciarimboli: Good to see you. Thanks for having us. Greg Fellerman: We’ve had the pleasure of representing a lot of law enforcement. It’s a pleasure. We love doing it. Ed: A lot of first responders. Dave: Well let’s see what’s up with this one. Here we go with Jack from Old Forge. He says, “I’m a police officer and was injured in a car wreck recently. My insurance company is telling me that I can’t collect underinsured coverage because of some exclusion. Is this legal?” What can you tell Jack? Ed: So, Jack, it’s legal and it’s appalling. And the only way that this can change is our state legislators and the state senators have to get rid of it. It’s called a regular use exclusion and what it means is that police car, ambulance, fire, if you’re in that car or in the ambulance or the fire truck, then your insurance company can say that’s a regularly used non-owned vehicle. And they can exclude your underinsured motorist coverage on that basis. This is something that absolutely must change for our first responders in Pennsylvania because, you know, I can’t tell you how many times…these police officers, they’re out there, they’re really doing an amazing job putting their lives on the line. And if they get hit by a drunk driver that has no insurance, they have no recourse. No recourse at all for the insurance that they pay for every day out of their hard-earned paychecks. I get fired up about it because it’s really a problem. It’s appalling. Greg: And here’s the thing — this goes out to 17 counties. I think we should challenge the legislators in the 17 counties that this station covers to do something about it. Go out there and fix this problem for these first responders so that they can get the protection they need. It’s not a Democrat or Republican issue. This is a really simple issue. And I think you should reach out to your legislators and ask them to do something about it. Greg: Oh yeah, we’ll help you. Dave: There’s the phone number, the website, they’ll help you out as well. Results matter with attorneys Greg Fellerman and Ed Ciarimboli. We’ll see you next time.